After months of research (summed up in this thermo-machines comparative table) and attending so many demos (I documented my Thermomix and Tefal demos on the blog), I have made my decision and chose MY thermo-machine. It was a hard decision and my study made me discover so many other machines than the famous Thermomix, that I got pretty confused in the end. Not a single machine had absolutely everything I wanted. It would have been too simple! – it is Magimix quality, very sturdy, doesn’t move, the joints are easy to clean, easy to take off and put back, it is heavy and stable, it’s definitely one of the best quality thermo-appliances I have seen in my research. – is this “blade-based” machine going to mush my beautiful curries and risottos? – will it make all the delicious recipes I sampled at the many demos I attended (such as the tuna dip, the risotto, the instant ice-cream, the apple-carrot-beetroot salad)? – will it make good bread? Along with Magimix, I narrowed my choice to Thermomix (latest version) and Kenwood Cooking Chef. Thermie was ruled out because of its smaller size, not enough for my family of 5 and many friends, its very annoying beep (yep! ), its terrible look, the less sturdy aspect of its construction compared to Magimix and its “Tupperware style” selling system. I will regret its integrated scale and its reverse motor for the blade (even this I am not too sure it changes anything, I will investigate with my friend Peggy who owns one). I will regret its dough hook though. I think it is truly unbeatable when you want to make proper bread as it breaks the gluten in the same way a baker would by hand. This is true especially if you can knead your dough at 37° and make it rise in the warm bowl (1° increment here too). I will also miss its special pâtisserie attachments. So as you can see, the decision was tough! But here it is. I have had a few days to play with it, when my work and kids let me ;) and I had a ball. Next posts I will tell you all about it in detail. I am a huge fan of their brand and the quality of their products. This one, like my other Magimix appliances is up to my expectations. I hope it will last me for many years. I flew all around the planet with this massive box (the photo makes it look small but it was a 20.1 kilo enormous thing). It was packaged in a cardboard box with a makeshift plastic handle… Miraculously it arrived intact! I was soooo excited when I opened the box. And there they were: the giant cookbook with 300 recipes, the scale and the instructions. 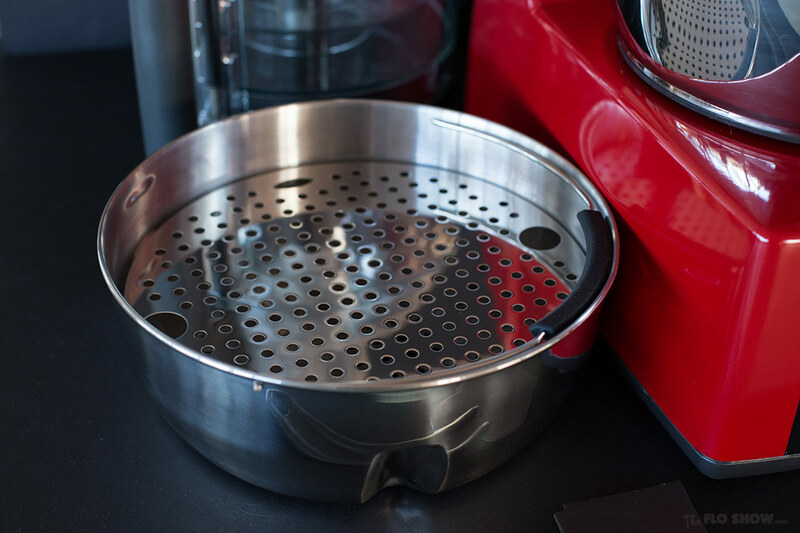 Wow, this is the big, big bowl and the steam system which is 100% metal, easy to clean and no plastic which I like. There was a special offer when I bought the Cook Expert. 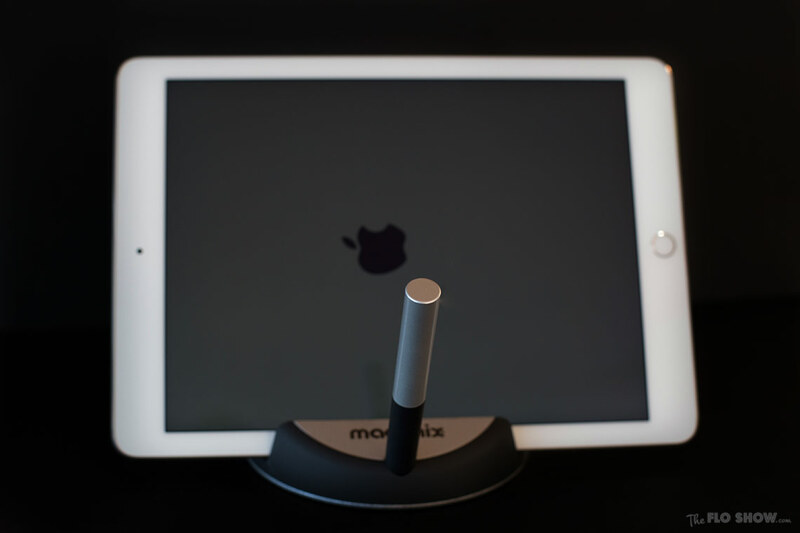 I was given an iPad stand with a pen you can use to surf the web when your hands are dirty or wet. There was also a free citrus press. And last but not least, in the list of 3 gifts, there was a smoothie maker / juicer. This is it! The steaming basket with the metal tray. How beautiful is this little guy… I chose the red version. You can see on the left the slicing, mincing and grating tool. On the far right the 300 recipe book, next to it the slicing and grating disks in their special box, in front of it on the right the egg beater, on the left the very powerful blade for bowl number 1 of the transparent food processor. 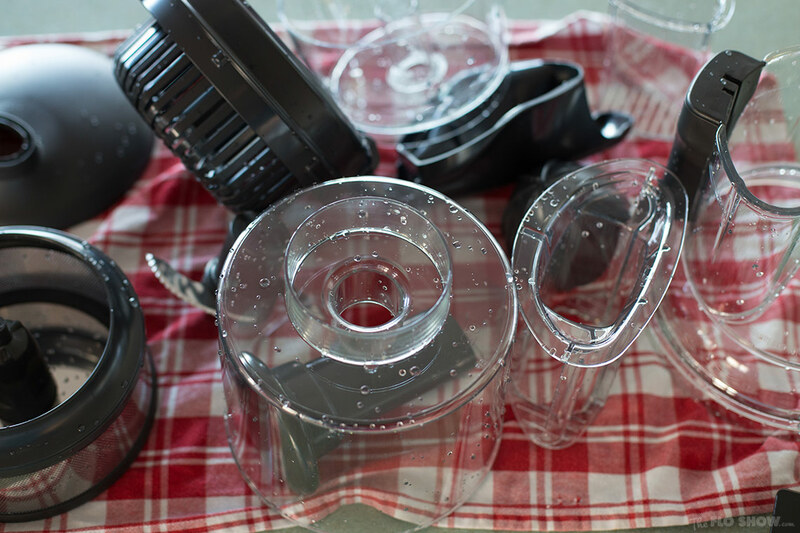 This transparent food processor has 3 different bowls or sections, the large bowl “number one” with the big blade is made to mince. It is great for salmon or steak tartare. The medium bowl “number two” is where you place the chopping and grating disks, think cheese, carrots, cucumbers, zucchinis, potatos. The mini bowl “number 3” has a small but powerful blade to chop herbs, nuts or anything small. You can of course use the main metal bowl to chop too. In front you can see two different spatulas designed to scrape the different bowls. OK then! This is the first recipe I made! The “floating island”. It is my dad’s favourite dessert. It’s comprised of a light French custard (we call it Crème anglaise which means English cream) on which floats large chunks (the island) of poached egg whites drizzled with marvellous toffee. No need to say that it is delicious and that the recipe will be on the blog soon. Of course, I will put a thermo-machine recipe and a standard one. A whole new adventure has started! I am so excited :) And I am not the only one! After 7 months of intense Magimix Cook Expert Cooking, here is what I think: pros, cons and a guided tour of the machine. See my numerous recipes using the Magimix Cook Expert. Thanks for your comprehensive review of various cooking machines. I can see why the Cook Expert is a good choice. The additional food processor functions (grating, julienne, etc) does differentiate it from the other cooking machines. I wonder if Magimix will bring it to Australia – it looks like its not yet in any country other than France, even in Europe. I wondered what will happen if there is a fault with the machine. How will you get it repaired here? How is your experimentation going? Are you coping without the dough blade? I saw that the Patisserie machine, which looks virtually the same and has the same functionality except the cooking part, does have a dough hook. Good luck with it! It really does look like a great machine. Thank you for your comment. Magimix will definitely have an International strategy but not now and it will probably take them a while before they figure out the after-sale problem. I called them to check if I could have hope to get an after-sale service in Australia one day, they answered that they didn’t have a planning yet. So, in my case, it was difficult to make my decision because as you say, if there is a fault, I will have to have the parts sent to Australia. So far I am having a so much fun (a bit too much probably :) with it. I have used it in average 6 or 7 times a day….. I find this machine extremely sturdy, powerful, very complete and clever. I have dropped some part… yes I know… it’s terrible… and nothing happened. I have used it nonstop for days and it looks still brand new inside out. I have burnt the bottom while experimenting: the food didn’t get a nasty flavour (strangely) and the cleaning part was tough but I got it back to normal. I looooove the food processor part and I wonder how I could live without one. I have made funny salads, great veggie gratins or bakes and the slicing took me a few seconds. I have made salmon and steak tartare. Basically it has changed my life. A lot of recipes I didn’t do before because it was too much work, I do all the time: risotto, rice puddings, custards (coffee, vanilla, almond, caramel or chocolate). The time it takes me to make my daily soup is divided by 2, at least. I could talk about it for hours like the seller who sold it to me :) Instead of cooking non stop I should take some pictures and publish a few Magimix recipes!! That’s great you’re getting a lot of use out of the machine. It must have been a challenge getting it here from overseas! I emailed Magimix in Australia to ask if the are planning to roll the Cook Expert out and got a reply the next day to confirm the Cook Expert will be arriving into Australia later in the year, possibly November. It was suggested I should keep an eye on the Magimix website for further updates: http://www.magimix.com.au. Perhaps that means you’ll be able to get support for your machine if anything goes wrong. I’m impressed I got a reply from Magimix so quickly, especially given the poor customer service and hassles I have had with another well known brand’s cooking machine (now in the bin unfortunately, based on the advice of TWO different small appliance repairers, after only 2 years of use). I’ve had a look at the extensive recipes for the Cook Expert – over 350 recipes on the Magimix website which I can follow although they’re in French. I shall start saving for the new machine!!! Thanks for bringing it to our attention! 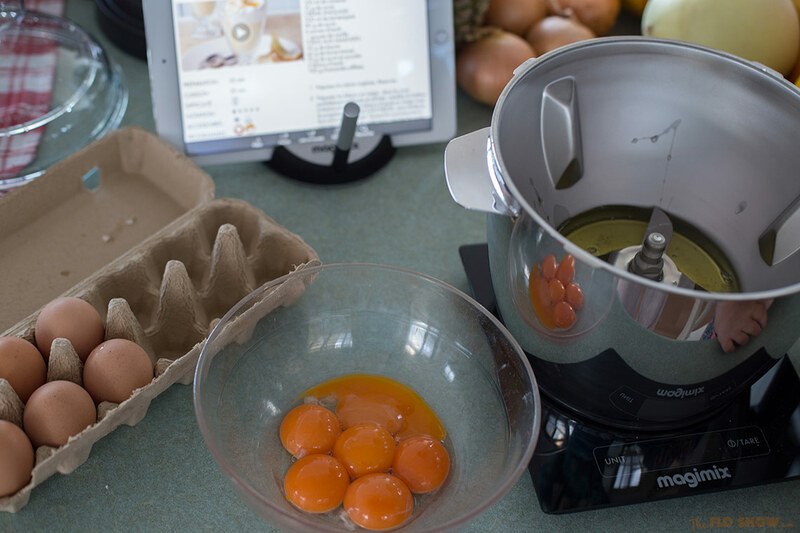 Great news, Magimix Australia are launching the Magimix Cook Expert in Australia. It will be in selected stores before Mother’s Day. Any repairs will be looked after by there service centres. Machine has a 30 year warranty on the motor with 3 years on parts and accessories (including the electronics) 1 year labour warranty. They will be releasing 3 colours, red, black and Stainless Steel. No idea… I’d love to know! Someone mentioned a price on one of my calls and seem to remember it was a couple of hundred more than the Thermomix. Hello where can I find the magi mix cook expert in the US? I have no idea :) My advice is to contact Magimix on their website and ask them. From what I heard, the market for thermo-machines is very small in the US, which I find very strange, but it might be a wrong info! I ordered mine from Australia and I have a current converter ;) I have it red as well ! So you ordered a Cook Expert as well as a Hot Mix Pro? How do you find it? HI there I ordered mine recently from a store in Australia . I have a converter and it works great. Looks great, did you manage to find any English cookbooks? I could easily import one to UK from France but need English recipes! Also without an external steamer can you cook and steam at same time like a thermomix. Certainly if an English book comes out will be tempted! I, too, am on the great thermo machine hunt! Every time I Google ‘thermo machines’, there seems to be another brand. Because I do have a small takeaway food shop, I do need something with a decent motor. I came across the Hotmix Pro Gastro machine, which is for light industrial use, with a price tag to match. I have also looked at the KitchenAid, which has a large-capacity bowl, but only a 450 watt motor. This morning, a retailer suggested I look at the MagiMix Cook Expert, and have now watched several YouTube videos in French, and read your review above. So far, I have not found enough information in English, with or without a video. The MagiMix seems to come with it own food processor attachments if your photos are accurate. Is this correct? What price -point do you think this machine will be in Australia? 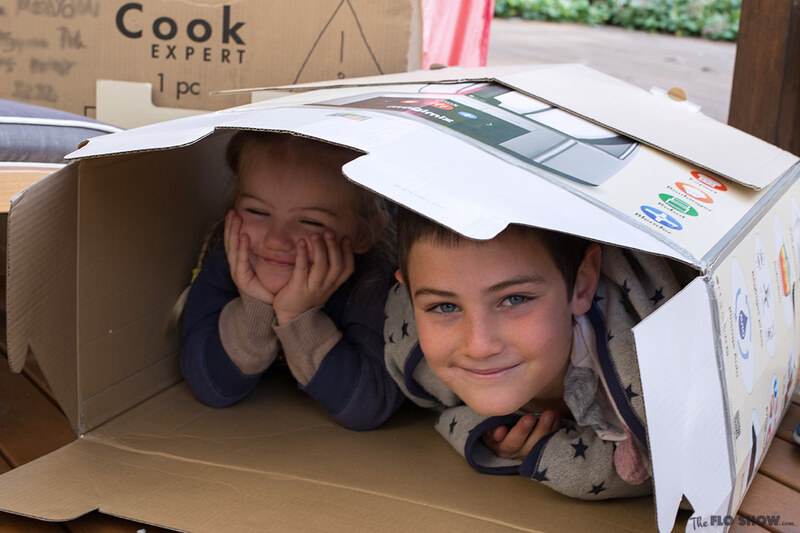 I went to a Thermomix 5 demo this week, and was very impressed with its simplicity, BUT, the party plan and plastic elements are strong negatives. Other machines do seem to need to change blades or bowls. Another question about the MagiMix: does it have any inbuilt memory capacity to add to? The KitchenAid has a simple SD slot; the Thermomix has its own design, but can save your personal changes to its recipes. I am attending a Hotmix Pro demo session is coming week, so I need to know if I should wait for the MAgiMix release before making a final decision. Thank you for your excellent article and, most importantly, your photos! Have you seen my comparative table? I have tried to put all the machines I would have liked to buy before choosing the Magimix as my final choice. http://www.thefloshow.com/review-compare-termo-appliances-in-one-table/ Some of them I have tried myself, some other I have seen a demo of, and others I have just read the maker’s website and reviews. It’s important to note that these machines except the Hotmix Pro are not made for a professional use. I know that a lot of chefs use the Thermomix and change often. They are starting to use the Magimix Cook Expert as well because it is very sturdy. I use the Magimix very extensively at home and it had a “tired motor” message only once. I stopped and restarted and it never happened again. 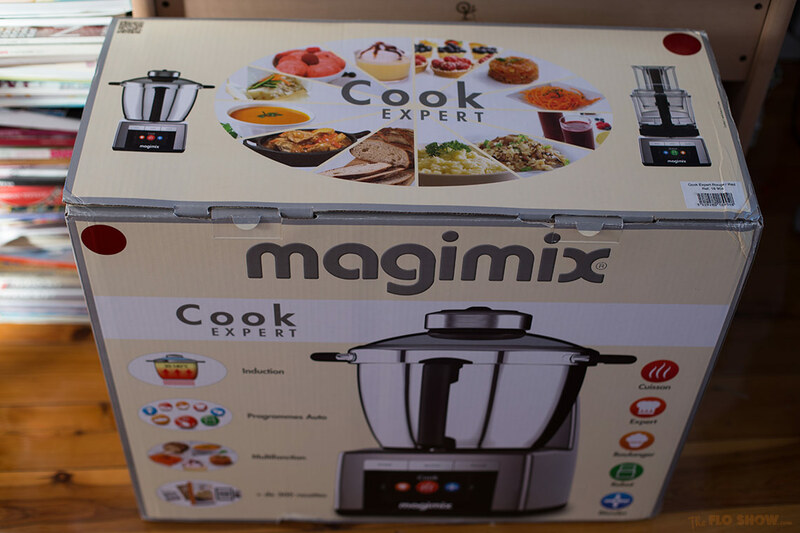 The Magimix comes with a lot of attachments: it is a mix of a thermo-machine and a food processor. The only thing you see here (in my photos) that are optional are the 2 juicers and the ipad stand. You will get 4 chopping and grating disks for the food processor which has 3 different bowls and 2 blades. 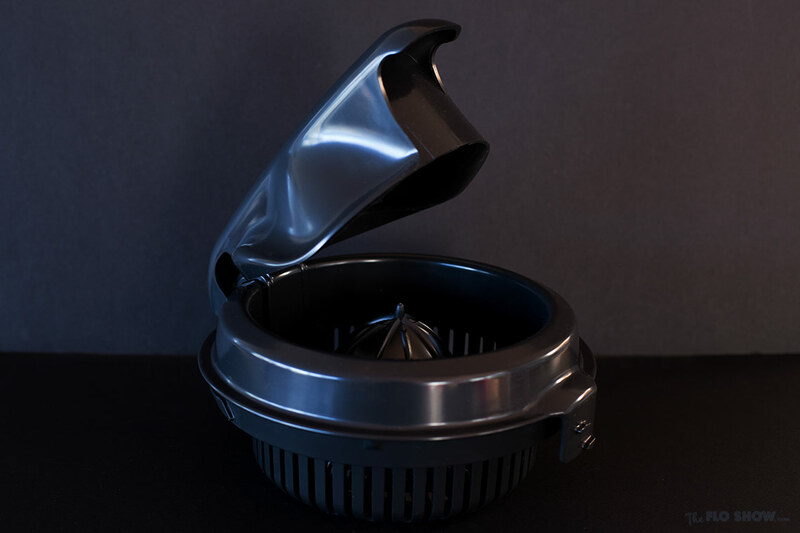 The metal bowl, heatable, has an egg-white beater attachment, a steam basket with a “shelf”. It comes with a scale (which I don’t like at all) and the recipe book (in French for now and probably soon to be translated). This “robot” as we say in French :) is not sold in Australia yet but will be in a few months. It doesn’t have a chip or SD card with recipes, it has internal recipes such as pastry dough, velouté soup, etc. This machine is to be used as a very clever stove top :) I adapt all my recipes to it. You will see a lot of recipes on the blog using this machine. The HotMix Pro is the best for that, you can record everything you do which means that you can prepare a special program for your employees for each recipe. I loved the fact that you can do caramel in the Hotmix pro. Technically it was my favourite machine, except that it meant buying a separate food processor, except for its small standard size, and its outrageous price for bigger sizes… It was too much for me. Let me know how you go with the demos. I’d love to hear from you. I bought the hotmix pro and it broke…. I was never really happy with it but the pin at the lid broke off and it cant be fixed…. difficult to clean too – I am wanting the magimix! This is crazy! I thought the HotMix Pro was a professional machine, so a very solid and durable one. I really looked into it because of the temperature level and the caramel possibilities. On the Magimix side, I really mistreated the poor thing, dropped the lid so many times, even the metal bowl and plastic bowls… and the cap (which should definitely be more firmly “lockable” if you ask me) and nothing happened. I have the Hotmix Pro as well and it works well but it is more cumbersome to use and accessing the built recipe is not user friendly . 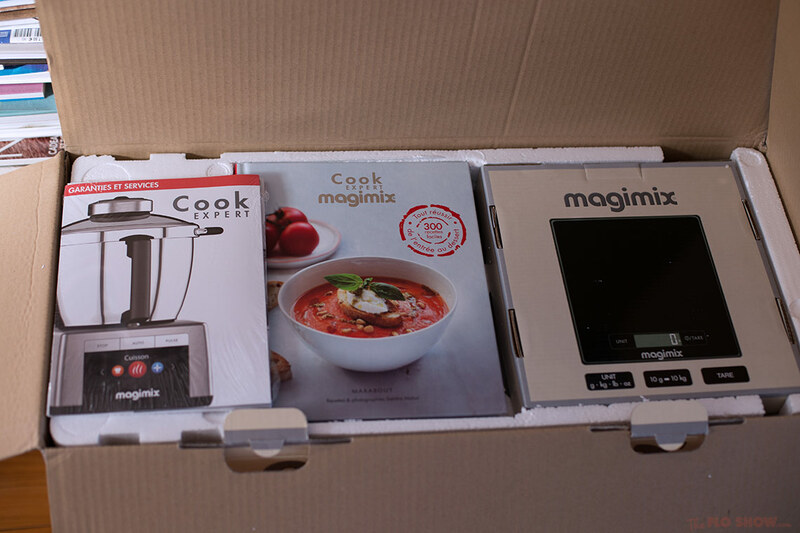 I really hesitated between the Hot Mix Pro and the Cook Expert from Magimix. Also I remember that you can create your own automated recipes. Is that the case with yours? I have made caramel but I have not created my own recipes as I work I really do not have much time. I ust want to make healthy meals in a reasonable time.I really do not use it much and would like to sell it but no one will probably buy it because it 220 and you have to have a converter. But we will see. I find lokking for the recipes is more cumbersome.It was the first one I had before I bought a Thermomix TM5 and I really like that one and I use alot of the recipes from many TM5 sources with Magimix. Thank you for your message. I’m glad you like the Magimix :) I’m sure you’ll be able to sell your Hotmix Pro very quickly on ebay or other. Well my Magimix heats up to 140 celsius as does the HotMisPro. The immobile blade is a great feature. It also allows you to cook sous-vide and to keep bread or brioche dough at 31.5° while it raises. The blade is part of the bowl. It is screwed tightly to the bowl to make it water tight. You cannot make the machine function without the blade fixed to the metal bowl. I’m really interested in the Magimix Cook Expert, but I would like to know if all the food it cooks is mushy? I heard a lot of critisim about the Thermomix only producing mush. I can see from the Magimix recipes on their app that it cooks stews. Just wondering if the blade shreds the meat. If possible can you please post some photos of some stews that you’ve cooked in the Magimix? It’s a difficult question :) Because it has a blade that stays there it will mush thing more than if you used a spoon in pan. This aspect was key for me before I bought it and it made me hesitate for a while with the Kitchen Aid or Tefal which have a removable blade and a gentle “pusher” plugged in its place for stews. But because the Magimix had so much more to offer I decided for it. If I make a stew I will post a pic. Promise. I am looking at getting my first ever food processor and have decided on a magimix patisserie, but then I have come across your article and I am know wondering should I wait till the cook expert gets released… Is a thermo cooking machine a good investment for a beginner? I want to do anything and everything when I eventually buy one. If I was to buy my first mixer or food processor now I would definitely go for the ultimate machine straight from the beginning. Buying the inferior model (without cooking abilities) such as the Pâtisserie one would be a loss of money as you will clearly want to get it later and will have to sell the other one first. I do recommend the Cook Expert for beginners because it is easy to use, the recipes are really excellent (even if I modified them a bit: less sugar for example) and it has so many functions and tools that you can start with the best tools straight aways. Now I chop, grate, mix, steam and make most of my desserts and risottos, dhals, soups, etc in it. I don’t know when it will be released in English at all. I would wait for the English version of the internal guide/menu and the book if I were you. Thanks so much for your advice really glad you told me to wait as nearly bought the patisserie last night. I really want to make everything especially raw food and I like to modify recipes. Looking forward to it’s release in Australia, possibly in January according to a magimix rep.
You won’t regret it. Heat really does add a whole dimension to this machine. Let me know when you get it. I am French too ! I will write in English not to be rude with the persons who will read the comments. I would like to buy the Magimix cook expert . I live in Aberdeen, Scotland, and they don’t sell this robot in UK. I would like to know how you managed to get one. Did you ask someone to send it from France to Australia ? And at the moment, with the recent terrorists attacks it’s more strict in the airports. I thought of buying one in France at Christmas time and bring it back in my hand luggage or to send it by UPS. I have also contacted a shop here that sells Magimix products to see if they could order it for me from France. Thank you for your comments and for your table where you compare different robots. Because if I can’t buy it I’ll have to chose another one. I need to cook much more than in France because I don’t like British food and we need to keep our habits, our cooking, our French recipes. But I spend too much time in my kitchen and a robot would be of a great help !! My friend Sophie, with whom I discussed “thermo-machines” a lot, decided to go for the Magimix too. She lives in Sydney too. But as she was travelling alone with her baby daughter, she didn’t see how she could carry this massive box so she asked Les Galeries Lafayette to ship it to Sydney for her. It was about 200 euros if I remember well. Maybe you could order one there and have it delivered? why did you reject the Tefal Cuisine Companion? I seriously considered it :) I went to a demo in Sydney and loved everything that was made with it. I liked the metal steam basket and the removable blade and tools, the power of its motor. If you don’t need the food processor part I would highly recommend the Tefal. It is great quality and is very powerful and efficient. Is there anything the companion misses, to be at the same level as the cook expert? Thanks so much for the info. This is a real game changer. This means that Moulinex/Tefal has provided what was really missing compared to the Magimix. And now I think it has a major advantage: the interchangeable blades… This means that the Cuisine Companion can offer a stirring tool which will probably respect the meat and veggies more than any fixed blade system. That would have made my decision much harder if it was the case last summer (French summer I mean). At moment in Spain where I live the cuisine companion is selling for 900 Aussie dollars (600 euros) compared to the thermomix at 1800 Aussie dollars (1200 euros) add 300 dollars for the new steamer and cutting tools and it is pretty good value. I’ve bought the companion but it will go back to the shop on Tuesday. Going to Darty (a french appliance seller) to look at a camera, I’ve seen their exposed companion. What a shock! All the silver parts of the companion, except the bowl, is plastic. And not very sturdy – it was broken in several places (cover, the silver plastic around the panel, on the side of the white plastic). One of the seller said that the cover only fell 1 time on the floor but she did’nt know what happen to the main part. That has changed my mind about the companion – with 3 little (lovely) monsters around me, the chance the cover fell on the floor is highly probable. I will wait for a nice price to buy the cook expert. After these few months with your cook expert, can you say us what you like and dislike with it (apart the points you’ve already detailed in the comparison table)? Is there any good or bad surprise you had with it? I’m thinking of buying the cook expert but still wondering about it. Have you tried to make a “crème chantilly” with it? What do you think of its “blancs en neige” (*)? Btw, thanks a lot for your comparison table, very useful! The only thing that can be missing is a link to the commercial website of each product (but this can be easily found by searching the internet). That being said, I love the pastry dough program. You tip flour, water and butter, press the button and get a perfect dough in 2 mins. It’s fantastic. > Scale: I don’t like it at all. It is not accurate when the bowl is on it and changes types (gr, oz, etc) all the time. It has the advantage of baring a heavy weight unlike my small usual Tefal. A scale is a small purchase but I was expecting better from Magimix. > The cap should have a better clip system to make sure that it doesn’t fall when you take the lid off and turn it to avoid hot water dripping all over you. > It is very sturdy!! I’m such a clumsy cook sometimes and I have dropped every possible piece of that machine on my kitchen floor. They are totally intact and without even a scratch. > Easy to clean. At first I thought I’d clean everything by hand to keep it beautiful and brand new for years. After a few weeks I thought… blow it… I don’t have time for this, I’ll rinse it and put it in the dishwasher. I was expecting it to change colour, especially the transparent plastic parts of the food processor. They are actually more shiny and brand new looking than with my hand washing. When you overcook something though, you need to soak it and scrub by hand first. > Some of the recipes look boringly simple but they are actually gorgeous. > The egg white whipping program is very good and tender on the whites, it doesn’t make them too stiff if you don’t want to, and it does if you do. > I got rid of my steaming machine, the Cook Expert is fantastic for steaming glutinous rice, veggies, meat and fish. > The instant ice-cream concept is fantastic. You have to make sure that all your ingredients are really frozen (fruits) and really cold (milk or yoghurt) or you’ll get a thick-shake. > I would love Magimix to invent a sort of blade cover which would bear high temperatures to protect you food from being mushed when cooked. > Once you have figured out how the machine works and what it does to your ingredients, you can adapt most of your recipes to it. > It would be great to use the induction and its reliable and fixed temperature to make yoghurt. > Same with dough rising in Winter. > I haven’t tried crème chantilly or whipped cream yet, I love the results with my Kenwood Chef which I use for that. The bowl being smaller, I can fit it in my small freezer. Thanks a lot for your answer :-) I’m now hesitating between the companion with the optional slicing accessory and the cook expert. I like not having lots of accessories (where will I put them in my kitchen?) and interchangeable blades but I’m still wondering about the plastic cover (I don’t like making food in plastic stuff, and even if food is not in contact, hot air interacts with it) and the 2 year garanty (but I have’nt found a comment saying that the companion is dead after 2 years). And Magimix is magimix – I trust them better than Moulinex, even if my mother used lots of Moulinex appliances when I was kid and never had a trouble with them. I’m like you Nessie… I don’t like plastic at all. I prefer metal or glass. I prefer the Magimix lid because it’s so easy to clip on and unclip and so easy to clean. That being said I really like Tefal/Moulinex. I have a few appliances from them including the excellent Acrtifry. If you have kitchen bench space to put your Magimix and cupboard space to put the food processor and the blade box, you’ll have no problem. In my case, my cupboards are full to the brim with French and exotic ingredients. I have a tiny kitchen (in Australian standards). My bench tops are disgraceful… I wouldn’t dare taking a picture hahahaha ! thanks a lot for your research. I have an additional questions, maybe you can give your advice!? I am German (and don’t speak good french), my boyfriend is french (doesn’t speak great German) . We r hesitating between the Magimix Cook Expert and the new Thermomix TM5. My problem is that i can not make a lot of research on the Magimix Cook Expert. All pages are in french since the new version is not out in Germany yet (I haven’t found a good page at least). Anyway, i still believe that the Magimix might me the better choice?! But the advantage i see in the Thermomix for my situation is, that i can switch easily between languages on the machine and i really like that you have all recipes in the machine. You also have the app and can adjust the recipes and “sent” them to the machine. Can u explain me how that works with the Magimix? Can i change languages there? Will the cooking book also be available as a chip + as a book? Can i adjust recipes easily and safe them in my app? Did i miss any important features or is everything else kind of the same? Thanks a lot !!!! Looking forward to hearing from you. In the Cook Expert, you do not have recipes on a chip. There are “programs” so for example, if you want to make a finely mixed soup (soupe veloutée in French) you only go to the “Cuisson” (cooking) section of the menu, choose “velouté” and it heats you veggies, stock and water, then mixes it slowly then faster and faster until it is silky smooth. There are no step by step recipes which I guess are very practical for people who have never cooked. The cook expert has only programs and settings and the book. In the book, each step is simply described. I promise it is very straight forward. Many of those recipes have become family favourites in our household such as: Dhal, soups, risotto, far breton, financiers, île flottante, etc. They are extremely easy to make and really delicious. I have adapted a lot of my home recipes on this machine which I consider now more like a stove top / food processor than a Thermomix. I really hesitated with the Thermomix too. I liked the idea of these integrated recipes and potential new chips to buy. But I am a cookbook collector, I wanted to be able to use the Magimix book and all my other books. 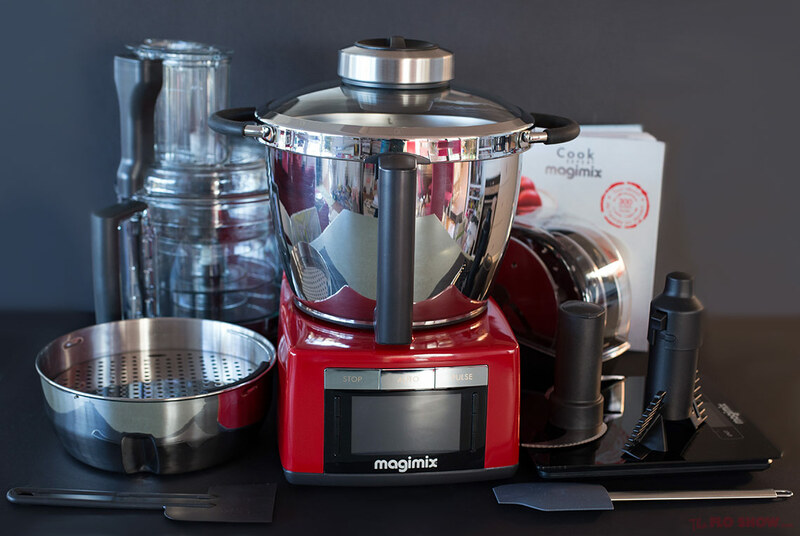 The reasons I chose Magimix were: the size, the metal, the more sturdy aspect, the fantastic food processor with all its blades and grating tools, the fact that it is very easy to use and doesn’t change colour or aspect after many washes. Probably also because it is French ;) even if Thermomix is made in France too. I think the food processor is a key aspect for me. I make a lot of vegetable dishes and it helps a lot. Same with meatballs, steak tartar, fish tartar and pâtés. I am currenlty looking at buying the cook expert but it hasn’t arrived yet in the UK. Right now I can’t decide wheher to get the cook expert of the Kitchenaid cook processor. I like the idea of the stirring tool on the cook processor but what puts me off it is the fact that you can’t seem to clean the main bowl in the dishwasher. I notice that you mentioned that you have cleaned the parts of the cook expert in the dishwasher, did you have any issues? With the cook expert, have you found that it does mush everything up as it doesn’t have a blunt blade? Last question but it is a bit random, do you know what the size of the box is that the cook expert comes in as I might have to transport it. When you bought yours did you have it sent to Australia or did you take it on the plane with you? I love Kitchenaid but I was put off by the non dishwasher safe bowl put me off too. I liked the stirring tool. Have you thought of the Tefal/Moulinex Cuisine companion? It has a stirring tool and is dishwasher safe. It now has a slicing/grating system and an external steam basket. The Cook Expert by Magimix has a sharp blade and doesn’t have the backward movement with blunt blade that the Thermomix has. It does mush the curries and soft meats if you stir them. It is gentle on risottos, dhals, firm meats. Also note that a few recipes have 0 movement/speed. It’s turns the machine into an electric pan or a slow cooker :) In that case, at low temperature, you can have a perfectly intact chicken curry. About the the mushing I am of the opinion that the Thermomix does too. The blunt blade doesn’t help much. Thanks for your quick reply and your comments. I think I will wait for the cook expert. I have had a quick look online at the tefal machine as although it looks good I do really like Magimix as a brand. My parents have had a magimix food processor for many years, first a 4000 and now a 4200 which I have used many times and it is a great machine so I think the cook expert will be just as good. I also like the fact that it seems you can use all the optional attachments that they already have for their food processors on this which would be great. One machine that I was all set to buy before I heard about the cook expert was the Kenwood Cooking Chef. I currently have a Kenwood Chef which I love so I thought this would be perfect but now I think I will just keep my old Chef and get the cook expert. I just hope its becomes available soon in the UK. One thing, do you still have the packaging for the cook expert, if so do you know how large the box is in cm? Sorry I forgot to answer your question about the package. I don’t have it anymore as I bought it last summer. It is absolutely huge… Well, how can I describe it… See an IKEA ottoman? Cut it lengthwise in half, this is your box. I put it in my parent’s car to go to the airport, then on the trolley, then dropped it at the check-in. The shop I bought it in (Galeries Lafayette) had made sort of handles with plastic. I kept my Kenwood for my dough, quick eggwhite whipping when my Magimix is doing something else, and chantilly (whipped cream). I hope Magimix starts to sell in the UK soon! Thanks for the information about the box, its good to hear that you were able to check it in on the plane and it survived ok. I have been thinking about the Kenwood cooking chef for a long time now but I must admit I use my food processor a lot more than I use my old kenwood so it makes more sense now to go for the cook expert. Thanks also for the instagram link, I have now followed it. Let me know when you get your machine. I’d like to hear what you think. Loved reading your reviews and opinions on your Cook Expert. I may have missed it if this question has been asked/answered, but does the Cook Expert allow cooking without the blades moving, and allow user to do a quick stir when needed? The Cook Processor allows ‘no speed’ cooking, and has a ‘quick stir’ button/function that one can press and it stirs the ingredients for a few blade rotations. So I’ll be interested to see how the Cook Expert compares on those specific functions. It looks like a really good machine and one I’d be interested in as well. The Cook Expert can be set on zero speed too. There is no “quick stir” program, you just press 2 times on speed to go from 0 to 3. I have just been on the kitchenaid website and it looks like they might be launching a slightly newer version of the cook processor as the lid looks different. If the whole thing now goes in the dishwasher it might alter my choice. The cook expert is still not available yet in the UK so I might actually switch to kitchenaid but I would miss out on the slicing / grating functions that the cook expert has. I have no idea when Magimix will launch the Cook Expert in the UK unfortunately. Here in Australia, it will be launched at the end of this month. If you get the KitchenAid, let me know what you think. I looooooove their cookbook, the recipes are amazing, the food photography is to die for. I’m looking at buying and adapting it to the Cook Expert. Thanks for the update. Right now it is a toss up between the kitchenaid and the Magimix, it might end up coming down to price in the UK. Like you I really like the kitchenaid cook book but I will let you know what I end up with. Jamie, the KA Cook Processor has new slicing/grating accessories coming out. I believe it will be in Australia end July 2016. Unsure when UK will get it but keep a lookout for it, who knows, they might do a whole package deal for the CP and the new accessory :). There is no new version of the CP, they’ve just updated their lid, thats why it looks slightly different. Flo, if you plan to update your comparison table (which I love by the way as it helped so much with so many machines to compare these days), I believe the tmx does not have induction heating. I might be wrong but I can’t remember reading anywhere during my research for a thermo cooker that tmx uses induction heating. That is one of the features of the Magimix that is very attractive to me. I did look at MyCook which has induction heating but their marketing model and sales support did not appeal. Geez I should definitely update this table… It tool me soooooooooooooo long to create that updating it gives me the shivers ;) I have added updates at the bottom of the post but I should change the mistakes at least. I have read in several places that the Thermomix had induction but you are right, it is not correct. It doesn’t have induction hence the 5°C increment! What I don’t like in the Kenwoods is this overhead system which leaves little room to pour things in the bowl. I feel always awkward using my Kenwood chef because of that. Maybe I’m the only one… but for me it’s a big discomfort. The reason why I was seriously considering it is the dough hook + low heat but I decided to keep my Kenwood for that purpose. I am not a huge fan of plastic. But one or the other are very sturdy and very efficient machines. These brands which my mum and grand mothers have used all their life can be trusted. The warranty question is a biggy. I have asked myself the question before going to France to get one. But at the end of the day, I wanted my machine as soon as possible, and trusted Magimix to provide me with a good machine :) I’m a bit of an optimist! If I have a problem. I will ask my mum to buy a piece for me and send it over or just order one online. Oh and about the kiddy snacks, I love the Aussie self published cookbook called Thermo-Struck. It has a lot of cool recipes including lunch box goodies. You will be able to easily adapt those recipes and the Thermie community ones on those machines. I have just bought the first Thermomix Magazine published in Oz. It’s fantastic. Thank you for your reply!! Also FYI there will be a blade set available for the supercook (and intelli, mistral etc) so it will be possible to slice like in a food processor. So for a more budget model this is looking better and better! Although blue price is anticipated to increase from $500. I still like the idea of the one you bought, and the tefal, too. Will you write a blog update on how you’re finding your machine now that you’ve had it a while, or perhaps I’ve missed it? * The price…. Not blue price! That’s great news! I’m looking forward to compare the prices. You’re right, I should publish a post after these few months of extensive use. I said pretty much everything in the comments linked to this post and the comparison table post but it is not very nice to read. I am looking for my All in One appliance. I am based in London where the Magimix is not sold yet. I was wondering why you discarded the Tefal Companion when you narrowed your choice down to 3? If I had to choose now, knowing that I couldn’t get the Magimix, I would pick the Tefal/Moulinex Cuisine Companion with the top steam option and the food processor option :) It’s brand new and quite impressive. Please, need the opinion of an expert in the magimix cooking machine! I’m considering buying it and I know is kind of an investment. I have a small kitchen and I would like to buy only one machine that would do the work of a food processor, blender and mixer at least. But I’m worried regarding its quality doing all that work. Could give me your option about some points, please? To mix the ingredients of a cake, is it as good as a electric beaters? Or it does not mix very well? Is the food processor function strong? Can I do nut butter with it? The smoothie function is effective or you lose a lot of fruit juice? I had a fruit juicer/processor that I practically needed to put around 5 apples to have one cup of juice. And the important question: cleaning? is it easy? Do you think is possible to wash it on the washing machine? This machine is pretty big but they all are :) If you see my comparative table, you can see the size. The food processor part needs to be stored with its slicing/grating disks box. You need space somewhere for those. In my case, my kitchen is a bomb, I have everything on my very crowded bench top. Regarding the food processor’s ability, I really think that you can trust Magimix with that. They have been making food processor for ever and they are the best quality, great motor power, great blades and multiple plastic bowls for more efficiency. I use it for grating my cheese (much better than the already grated one with lots of additives), carrots, cabbage, steak tartare, salmon tartare, kids dry fruit bars or balls, nut grounding, pâté or liver mousse, meat balls, etc. Regarding the metal bowl part, you can definitely make amazing smoothies in it, the speed 18 which is very powerful and makes a moussy kind of texture which is fantastic. I use it a lot for cake mixes. It’s very good. You need to feel free to use the speeds back and forth as you wish. I make the best pastry crusts in 2 mins. I haven’t tried butter yet. I have the juicer attachment but I haven’t used it yet. I put the whole cored fruits in the metal bowl and make smoothies instead. Cleaning is easy if you haven’t carbonised it ;) I have… and I let the bowl soak overnight and scrub. It didn’t ruin the metal. I got it back to it’s former glory. If you have food attached or burnt at the bottom it’s better to soak it first and scrub. If it’s the usual creamy leftover, use the rinsing program with dishwashing liquid, then disassemble (super easy and quick) and everything goes in the dishwasher. Hi there, I am wondering what you think of this machine now a year on, as looking to purchase one next month. Nessie has asked me the same question on this page, check it out. I will write a special page with all the details soon. Thanks, I went back through the 46 odd replies and found them all very informative. I dislike the Thermomix as so much of the food is mushy. My food processor is cheap and nasty to the point my 4 year old needs to sit on the bench and hold it with two hands to stop it moving around. So am in need of a new appliance. Yes indeed, the Magimix will be arriving in Australia in April. I don’t use my Cook Expert for stews, curries and things like that. I do it the old fashioned way. I use it for everything else though. And there isn’t a day without using it. If you get it, let me know what you think! There is a new lid for the Kitchenaid I have read, and according to magimix Australia’s Facebook page the cook processor may be launched this week (they said a few days, but they also said that the week before as well). I was in peters of Kensington at the weekend (they’re huuuuge fans of the kenwood cooking chef there! They thought it was a real shame it didn’t get the support on release that it needed – I spoke to the lady about how every other thermal cooker has a Facebook page for support except the cooking chef and what a shame that was as the support is a huge component of the decision for people like me who aren’t confident with these sorts of machines yet) and they thought the release may be related to stock issues as they had problems with it selling out in Europe already. But who knows, I guess we will hear when we hear! I’m saving up for the magimix, but will go to the demo and of the cooking chef first I think…. Unless there’s some crazily awesome release offer with the magimix that I can’t resist ;) they had the kenwood for $1600 at the weekend (10% off) I hope someone sets up a cook expert Facebook group in English soon if I do! Maybe you could do it, Flo?!?!?! I read in the Aussie press that the price will be $2099. I bought mine 1099 euros which would be at today’s rate $1657. I guess importing such a heavy machine to the antipodes is very costly. Let me know what you decide OK? A bit as a joke with friends, I have decided to cook each and every one of the 300 recipes from the book. I will publish most of them in here. Watch this space: http://www.thefloshow.com/category/recipes/with-magimix-cook-expert/ I will publish my own Magimix recipes and the book ones I’ve tried and sometimes altered. Thank you :) I will keep an eye out! Sorry to hear about your bellini experience, I’ve only had good experiences – but it only takes one person to ruin it, right? It’s alright :) I’m not traumatised but I don’t feel like sharing on this group any more ;) The Magimix Cook Expert Australia one seems to be very friendly and I’m careful of what I say now… I probably didn’t have the right tone in the Bellini group. Thank you so much for sharing my table. It’s a little outdated now because brands are updating their machines all the time. I’m adding info at the bottom of the table to keep it up to date. I saw that The Flo Show was at the top of the Magimix google search. It’s exciting! Julia Child’s movie comes to mind! On the Magimix Australia Facebook page it says ………,.TOMORROW! The Magimix is in the news today so can’t be far away! Says it is $10 more. Is it going to be 2019 then? Wahoo it is on their website! I have some more news :) The shipment of the machines by air has left France and will be in Australia very soon. It will need to be treated by customs and dispatched in the stores and then it will be officially launched. It should be done at the end of the month. In Sydney, the shops will be The Essential Ingredient and Peter of Kensington. They will have exclusivity for a while and then larger, quality chain stores will sell the product. to stir with the blunt side of the blade. Does Magimix do the same? No The Cook Expert doesn’t but to my opinion, it does as well if not better when it stirs, it doesn’t mush. It has many setting possible to avoid mushing: zero speed, 1A & 2A speeds which alternate slow and stop. You can also use the slowest continuous speed: 3. You can use the butterfly attachement which clips on the blade. 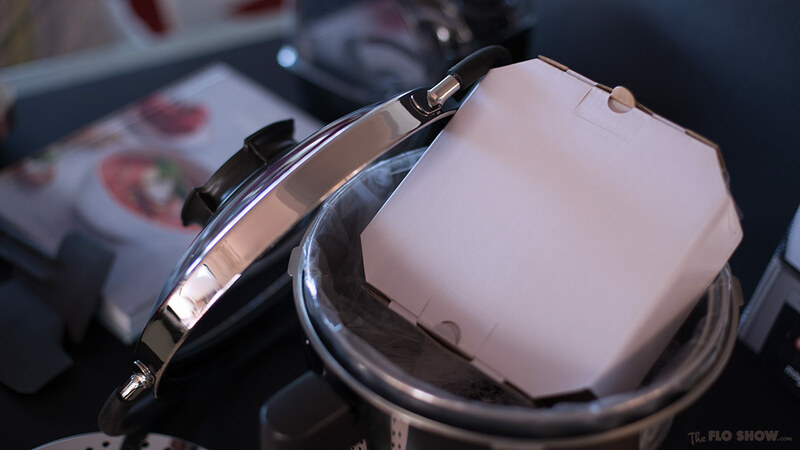 The key is to cut meat in bite size cubes and fry the onions, spices and meat at zero speed or very low (using the Magimix as a pan), then add sauce or liquids which reduces the friction with the blades. In clear, I have had chicken curry with perfectly shaped and firm cubes which were extra moist and soft inside. I am in the process of deciding between a magimix expert cook and thermomix… Just wondering if you have cooked pasta in the magimix? I know the thermomix can do this by ‘ reversing the direction of the blade’ and therefor is ‘stiring the pasta’ not chopping it. Can you do similar in the magimix? There are many pasta recipes on the Magimix community especially new “one pot pasta” recipes: you put your dry, uncooked pasta and ingredients for the sauce in the machine, and cook it all together. It’s a great concept. The Magimix Cook Expert doesn’t have the reverse movement but you have: the option of no movement at all (immobile blade) or 2 very low alternating speeds which work great without chopping or mushing. so tofu and noodle are an important part of my diet. I have never tried noodles or tofu in the Cook Expert. I will definitely but I cannot help there. Except that one of the big trend on the Magimix community recipe website/app (in French mainly) is the one pot pasta and it works very well apparently because people leave great comments. Don’t forget that you have a 0 speed setting and slow alternating speed which really respect the food. Love your blog and the info. I was interested in the Tefal, but may now look at the magimix. During your research did you find it a problem that the Tefal does not have an easy to hold handle for pouring and using a scraper with the other hand? It looks to be the only cooker that does not have a dedicated handle. Thank you for your comment on the blog :) It’s funny, you’re the first to ask this question, I didn’t regard the subject as important for me when I did my comparative table and when I first used the Cook Expert I realised how vital it was to have one one side a unique handle and on the other a pouring “thingy”. The reason is simple, and you’re right. When you pour something, you have the bowl in one hand and the spatula in the other. I like the pouring little metal thing which directs the liquid in the right direction. He arrived yesterday and I’m trying to figure out how to use it by reading your blog. Thank you for your comment. I hope my blog helps. Do not hesitate to ask me questions if you have any. The best way to start I think is to make a few recipes. If you’re asking if you can cook rice and curry at the same time, yes, you can steam the rice while you cook the curry. I have a very simple technique with my pan and stove top so I use that. But I have steamed a lot of rice including glutinous rice with the Magimix, it’s fantastic! There is absolutely no reason for time differences between the Thermomix and the Magimix except that the Magimix can cook at higher temperature and more precise temperature so you can risk going higher for custards for example and go faster that way. A different cooking time means a different cook and a different recipe. I have never cooked pumpkin in 12 minutes! This sounds strange but why not. You can totally do that with the Magimix too. all you need to do is choose the soup program and change the time :) The great thing about this machine is that all the programs can be adjusted. This machine will make you gain a lot of time. It’s fantastic for dahls, risottos, soups, custards, stews, mashes, minced balls, sauces, cereal bars, etc. Oh thanks so much for the reply. There is a demo in July down my way but would like to buy before that. I almost bought during the week as myer had 10% off appliances….so by the sounds of it the magimix can do everything the thermie can plus has the food processor too. I will join the Facebook site too. Today I discovered the Cook expert. Is there somebody who is using it for 1 person? Same thing with custards, “riz au lait”, dhal, and nearly everything is doable in small quantities. You will be able to use the steamer for small fish fillets, muffins, 1 carrot and 1 potato or half a leek for “poireau vinaigrette”. Have fun with this machine and let me know how you go! Thanks a lot for your answers. If I buy the Cook expert, I will let you know. In the meantime, I will follow your blog. It is lovely and with a lot of good information. I can’t wait to hear about your Cook Expert! And the nut butter experience :) I think you’d better off using the food processor part of nut butter, but saying that, I haven’t tried the metal bowl yet for it. 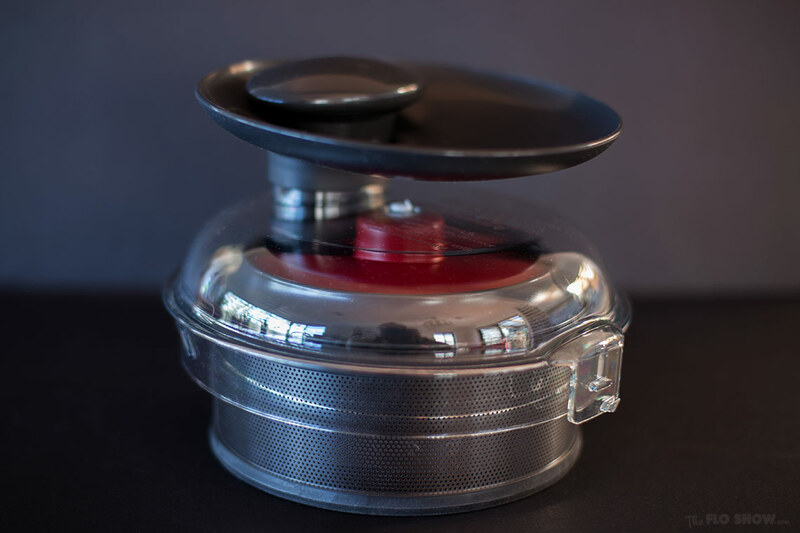 In case you have’nt heard of it, Magimix is going to sell next year (in France) a steam basket for the cook expert, a little like the Thermomix varoma (it will be positionned on top of the metal bowl and will replace the glass lid). The price will be around 150 euros. I’m about to write about it very soon. This sounds really interesting, does anyone have a photo of the steamer? I will publish an article very soon with photos of the “beast” showing products inside so you can have an idea of what it can contain. I don’t want to reveal too much here but I bloody love it!! Can’t wait to see a picture of it! I promise I’m doing my best :) As soon as I can the pix will be online here. First of all thank you for your group which has been super helpful and a real source of inspiration. Thank you for the great job you’re doing! I have extensively tested the new steamer I got in Paris on my last visit. I’m preparing a full article on it and on a few great improvement Magimix has done to the Cook since I bought mine in french summer 2015. Very informative. Magimix is gaining popularity quite steeply. I have been looking for credible material and this post will benefit me massively. Thank you so much for your nice message :) I’m glad I could help!! Hi, fantastic review! I am interested in your comments regarding the precise temperature controls of this appliance – is it possible to cook foods to exact temperatures (without a thermometer) or is the temperature control regarding the heating element? (e.g., if I wanted to boil a sugar syrup to 118C or temper chocolate to 30C etc). Thanks for your help! The temperature variation is 1 degree, so it’s pretty precise. I haven’t tested it personally because I’ve never needed to. But you could probably test it with a probe. I’ve heard that you can temper chocolate. I haven’t tried it but some French chocolatiers use it for that, at home or during classes, when they don’t have the big machines. For sugar syrup, I guess it’d be possible but I haven’t tested.